Closing my eyes, another torch lights within. Suddenly a mother-like form appears. It says, showing her lap. And the cool breeze nods through the window. Affectionate father’s voice resonates from somewhere. Indeed! It had been long since I was this hungry!!! Says somebody resembling elder siblings. Heart breathes contented after a long time. And I glide down the slide in all merriment. I kept awake for you,” says a friend taking me in by locking hands. A rustle leaves embracing each other is heard from behind. A warm beam through the window pricks in the eyes. I find wrinkles and dark circles under the eyes. 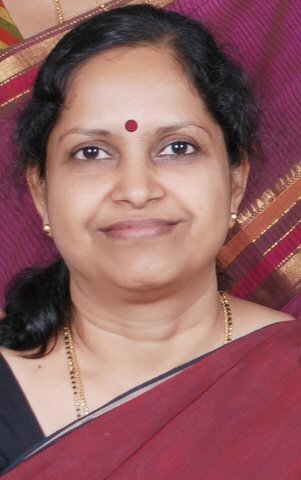 Sarada Sivapurapu, is a (voluntarily) retired Andhra Bank Officer settled in Bangalore. She says her interaction with people and their behaviour at the bank had given her material enough to continue after retirement her literary pursuits she had left off before joining the bank. She writes poetry in Telugu and English and has published some short stories in English on the net. మనుషులకి రూపం పోసుకుంటూ, జీవం ఇచ్చుకుంటూ…. అబ్బ ఇంత చక్కని ఆకలి వేసి ఎన్నాళ్ళయిందో! గుండె నిండా ఊపిరి నిండుతుంది చాలా రోజుల తర్వాత. హడావిడిగా లేచి అద్దంలో మొహం చూసుకుంటే..
అసలు నిద్ర పోయినట్లే లేదే, ఇన్నేళ్ళుగా కల కంటున్నానా???? ?